Understanding Facebook’s advertising tools enables companies to conduct research among the difficult to reach 18-to-29 year old demographic group. Recently a client wanted CFM to conduct focus groups among young adults in the Portland, Oregon area. Usually this means randomly calling hundreds of phone numbers and asking screening questions to find 12 persons to participate. It is costly and time consuming. But for young adults, it is even more difficult because nearly half don’t have landlines. We told the client traditional recruitment methods weren’t going to cut it. We recommended using our social media knowledge to recruit young adults. First, we created a Web site that featured a qualifying survey. The survey included questions to identify communicators – people comfortable talking in a group about sensitive issues. To drive traffic to the site, we created a Facebook advertising campaign. Using Facebook targeting tools, we were able to pinpoint where the ads would be place based on demographic and special-interest characteristics. Carefully monitoring results and flexibility was important. After launching our ad, we noticed our campaign was not getting the response we had hoped. We were able to revise and upload new ad copy in less than an hour. By catching and correcting the problem early and making adjustments, we greatly improved the success of our campaign. 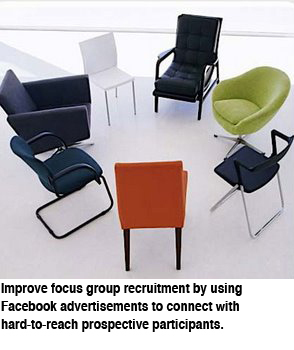 In the end, we were able to recruit more than enough participants for the focus groups. The client was thrilled with the results. Information derived from the focus groups helped refine product features to meet the wants and needs of a difficult-to-reach target market.